What’s wrong with our water? Apparently nothing and everything at the same time. While the rest of South Asia is increasingly feeling the pressure of water stress induced by population growth and urbanisation Sri Lanka has been told that it will be among the few countries who will experience low water stress in the future. But this comforting fact literally holds no water if Sri Lanka continues to pollute its groundwater and its dwindling freshwater resources at its current pace. The quality of freshwater and groundwater can easily be compromised through malpractices by both industry and people. Water has become a priority issue for many development practitioners who recognise the potentially devastating impact of water stress on companies and communities. Companies that depend on water for their operations such as MAS also recognise that the responsible use of water is a key business issue. As a key consumer of dyes and colours, the apparel and fabrics industry also uses significant amounts of water while using these products to process its yarn and fabrics. The journey in 2011 MAS began extensive research and development to create a long term solution for the problem of ETP Sludge. So began the Great Brick project at the MAS Fabric Park in Thulhiriya which has become one of the group’s most sustainable initiatives towards zero landfill. After months of intense R&D the teams achieved a breakthrough which turned ETP sludge into eco bricks. Since then MFP has perfected the process and has converted all its sludge to thousands of bricks. 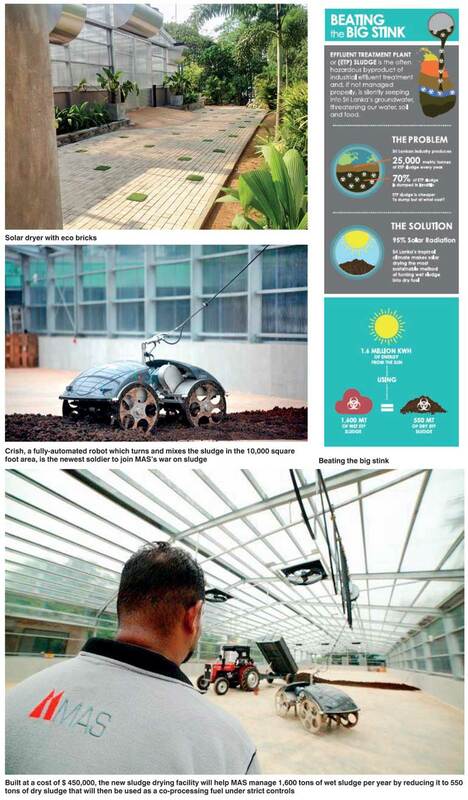 In 2015 the zone turned all of its 600 tons of ETP sludge into 70,000 bricks, tiles and grills that have been used by the group for the landscaping of its own facilities. The operation is 95% dependent on the heat of the sun with solar radiation used to evaporate the unwanted water fraction. The state-of-the-art green house facility has the ability to harness more than 1.6 million Kwh of free energy annually via solar radiation. The one-man facility is complete with Climate Sensors , PLC’s (programmable logic controllers ) and SCADA (supervisory control and data acquisition) solutions for remote monitoring for engineers to view and control the parameters from anywhere via GSM.